Men and women have different requirements when it comes to nutritional support. 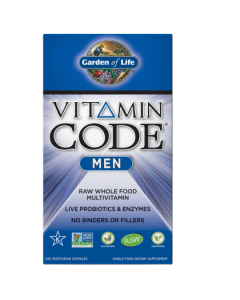 Vitamin Code Men’s Formula is a comprehensive multi-vitamin with specific nutrients to support prostrate health, mental and physical energy and heart health. There is overwhelming science and experimental data which support the use of nutritional supplements for disease prevention, immune system boosting and optimal digestion. An article published in the Journal of the American Medical Association by Robert H. Fletcher and Kathleen M. Fairfield from the Harvard School of Medicine concluded that “it appears prudent for all adults to take vitamin supplements.” They noted that inadequate intake of several vitamins has been associated with the development of many diseases that included coronary heart disease, cancer, and osteoporosis. Vitamin Code Mens Multivitamin Formula is a comprehensive multi-vitamin with raw, organic, whole food created nutrients, minerals, probiotics, and enzymes. This formula is delivered in capsules without the use of any binders or fillers. What’s Different About Vitamin Code Men’s Multi-Vitamin?